"Ancient tradition honours the Himalaya as the embodiment of the gods, and it is easy to see why: the mountains are on a superhuman scale, both beautiful and dangerous." (intro. Insight Guides). 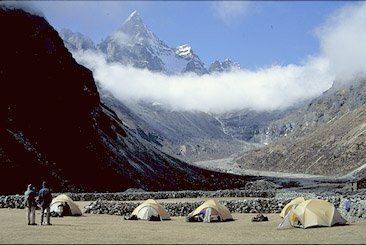 This region is claimed as one of the best trekking areas in the world. It spreads around five districts (Kaski, Myagdi, Mustang, Manag, and Lamjung). Beginning at an altitude of 790m. the area reaches as high as 8091m Mt. Annapurna with the lake at the highest altitude in the world known as Tilicho Taal (4919m). This region is rich for its biodiversity starting with subtropical climate to Alpine and Trans-Himalayan (rain shadowy) part of Nepal. It inhabits 102 different kinds of mammals including rare snow-leopard, and blue sheep; 478 species of birds including endangered species Impeyan pheasant and Blood pheasant; 39 species of reptiles; and 22 species of amphibians are recorded to the date. This trek begins with Brahmins hymns, reaches the top for Buddhist chants and descends down with fusion of Hindu-Buddhist colourful culture of Thakali, Gurung and Magar ethnic group. 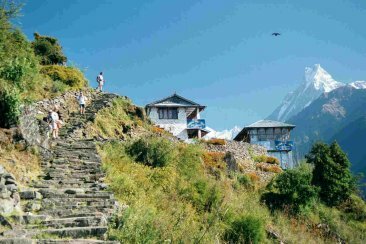 The chief attraction of this area is Langtang Mountain range in the north of the valley and several lakes in the south. This region is also famous for the culture of ever smiling Tamangs (ethnic group). The region covers three districts (Nuwakot , Rasuwa and Sindhupalchok ) starting at 554 m tropical climate giving way to alpine towards higher altitude. The national park accommodates various species of wildlife including rare Red Panda, Musk deer, Snowleopard etc. Common birds seen here are tragopan, impeyan pheasant etc. And the region is also famous for its holy site Gosainkunda lake. devotion to the practice of Buddhism. Diverse range of wildlife and vegetation are seen in the region. Animals to be sighted are mountain goat, musk deer, and barking deer in the forest. Everest National Park is habitat to 118 species of birds. Common among them are Impeyan Pheasant, Blood Pheasant, Red billed cough etc.